Pilgrimage has been a part of Christianity since the very beginning. Straight after the time of Jesus, the early Christians tried to visit the places Jesus had visited - Galilee, Bethlehem and Jerusalem. As Christianity was at first banned by the Romans, such journeys were almost impossible but as soon as faith in Jesus became the accepted religion, these journeys were once again popular. As the Church grew and became more established, pilgrimages were made to other special places, usually following in the footsteps of the saints, such as Rome itself and Constantinople - now Istanbul. Through the centuries, other pilgrimage centres have drawn people of faith including Canterbury and Walsingham. People go to these places because something important occurred there. They become a kind of channel for God’s grace, and often healing miracles are associated with the place. In England Walsingham became a pilgrimage centre as early as 1061 and for a time rivalled Rome for its popularity among pilgrims. Lady Richeldis, the Lady of the Manor, had a vision of Mary instructing her to build a copy of Mary’s house in Nazareth. This was done, and on completion a spring of water was discovered which is claimed to have had healing powers ever since. In fact the Holy Water used at St. George’s Church comes from Walsingham. This quaint little village lies near the north Norfolk coast and it’s become known as “England’s Nazareth”. Through the centuries millions of people have made the journey on foot, on horseback, in carriages, on trains and more recently in cars and coaches, to visit this place. King Henry VIII made his pilgrimage and walked the final mile barefoot, hence a small chapel called The Slipper Chapel. This is now at the heart of the Roman Catholic Shrine and most pilgrims make a visit there during their stay. The same king, in 1538, destroyed the Shrine during the English Reformation. He couldn’t destroy the enthusiasm of pilgrims, however, and a small number of people kept the story of Walsingham alive. The Anglican Parish Priest of the village, Fr. Hope Pattern, started to rebuild the Shrine 400 years later and gradually pilgrims began to make the journey once more. A new Holy House, still based on Mary’s home in Nazareth, was installed and today pilgrims from many different countries visit the Shrine each year. Among those are pilgrims from Waterlooville, Havant and Leigh Park who have been travelling together for around 25 years. Their pilgrimage is always the weekend after Easter. 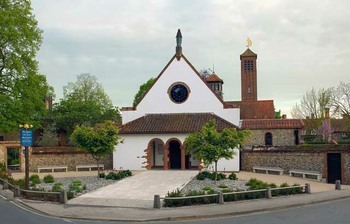 Today, with the help of a Millennium lottery grant, the Shrine has changed dramatically, with a new Entrance, Refectory, Café Bar and some new Chapels. There’s also new and refurbished accommodation with some rooms en-suite! The Shrine staff and clergy aim to give every pilgrim a happy, comfortable and most importantly, a spiritually uplifting pilgrimage. The worship highlights include two outdoor processions around the gardens, a healing service and an opportunity to be sprinkled with the Holy Waters. It may have begun all those years ago, with a vision of Our Lady, but Walsingham today is both a vibrant and a holy place where pilgrims, following in the footsteps of kings and peasants, can still go and experience the power of the risen Christ.